One last hope remains. Following the Fenrir Organization’s development of “God Arcs”, Oracle Cell-based living weapons, their wielders are organized into an elite force of “God Eaters”. As the newest recruit to Fenrir’s Far East Branch, discover that in times of adversity, humans will go to any length to survive in God Eater: Resurrection. It's like Monster Hunter meets Freedom Wars. The first game is a remake of the PSP game. It's all awesome. This has me super pumped! I can't wait to make some custom bullets again! I missed that first one. So this is pretty excellent, yes. 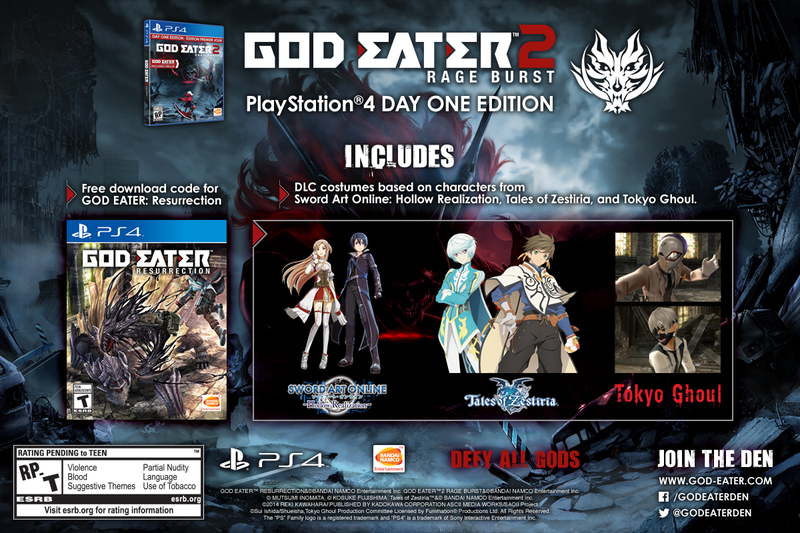 DLGamer has the Steam (PC) copy of God Eater 2: Rage Burst on a 20% discount (from $49.99 to 39.99). Although part of the promotion does not include the costume set, you WILL receive a free copy of God Eater: Resurrection. God Eater's developer, Bandai Namco, revealed one of their newest project: God Eater Online, a smartphone MMO. It's currently in development, so a release date is still pending. Besides GE Online, Bandai Namco also has another God Eater project in the works for console. Btw I noticed the tag "Dating Sim" on its Steam Page, is it really? I mean is it included in game? I haven't got the chance to play the psp game, but I have watched the anime. * God Eater Online is set in a world that takes place years after the events of God Eater 2: Rage Burst. * The â€œAbyss Factorâ€ is a new element that is learned as your character level increases. These are skills that can provide buffs or powerful attacks. Not only do they become stronger as you level them up, but theyâ€™ll also change in appearance. * Next up, we have a look at the â€œAbyss Aragami Bullet,â€ which is basically a powerful attack that comes in the shape of an Aragami. These are available after devouring an Aragami and using it as a new special shot. The new special shot not only packs a punch along with its effects, but now has the visuals that come from the Aragami. * God Eater Online is expected to launch this year for Android and iOS. I have God Eater Resurrection just waiting for me on my PS4. I pushed through most of the tutorial jazz, but that was about as far as I made it before real life took over. I dig it though, I really do.